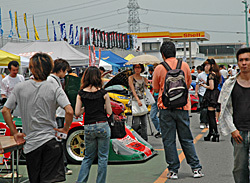 Rotary fans across Japan gather commence at Tsukuba Circuit! Every year on July 7th, (7/7) the rotary heads from all across the island of Japan gather at this designated spot. What makes this year's gathering even special is the appearance of RE Amemiya's Mr. Amemiya and Sanai Works's Mr. Ishii had formed an organization called the "Rotary Tomo no kai"; meaning Rotary circle of friends. To celebrate the start of this organization, the biggest rotary meeting in the history of Japanese motorsports took place at the Tsukuba Circuit. 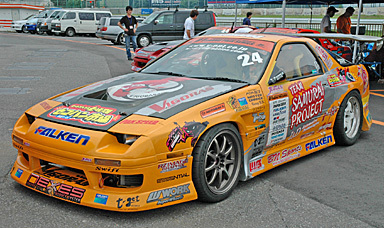 Some events that took place were a talk show with the drivers and campaign girls in the paddock area, time attack on the course with shop demo cars, and a drift competition. 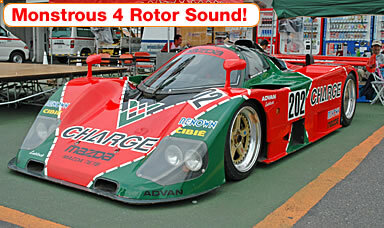 The 4 rotor 767B made an exhibition run which pumped the adrenalin of all the rotary enthusiasts that came to this event. There was too much content to cover, so please check out the magazines- OPTION, OPTION2, and Drift Tengoku! Note : Windows Media Player may be required to watch this movie. The engine virtually remains stock except for the Trust TD06-25G Turbo with 1 bar of boost good for 420 horses. 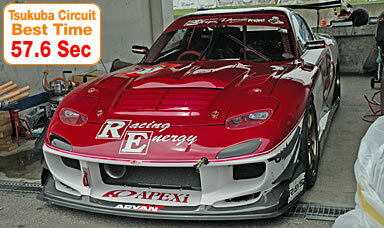 This rotary feels more like the stock turbos with increased boost meaning it is very easy to ride. The vehicle is 100% compliant with the Japanese vehicle inspection laws and as a bonus, the a/c and the stereo is still intact. 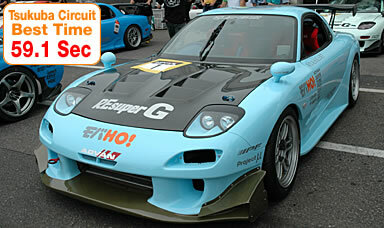 With that said, the machine managed to tear up the Tsukuba Circuit at an amazing 59.1 seconds. 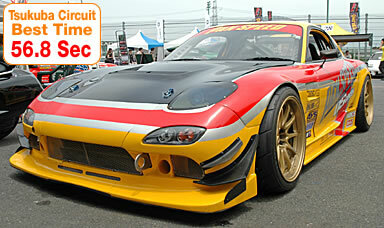 This is the dream FD3S that every rotary enthusiast wants. There are no special modifications made to the engine, just the usual side porting and other modifications that they provide for their customers. The engine was mated to a HKS T04Z turbine and pumped at 1.1 bar of boost good for 480 hp. The rear diffuser creates an illusion of making the underbody look bigger than reality. The functionality is that it enables the vehicle to keep on the throttle at tight turns like a Formula spec machine. The engine had been side ported and mated to an HKS T04Z turbine which creates massive torque at the mid rpm range. At 1.1 bar of boost, the motor puts out 548 horses. The exterior looks as though the vehicle means serious business and sure enough the interior did not disappoint. Having a race car interior, the entire chassis was weight balanced with a 40 liter fuel cell mounted securely on the passenger side. An HKS T04S was chosen and boosted 1.3 bar good for 450 horses. 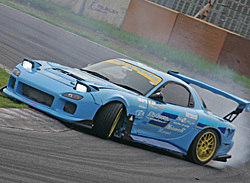 Since Drift Samurai tends to use the higher rpm range while drifting, the intercooler and the radiator were mounted in a V position. The carpet and the undercoat were left alone to provide little comfort for the race machine. The silver padding next to the clutch assembly is a heat guard that prevents Drift Samurai's leg from getting toasty.